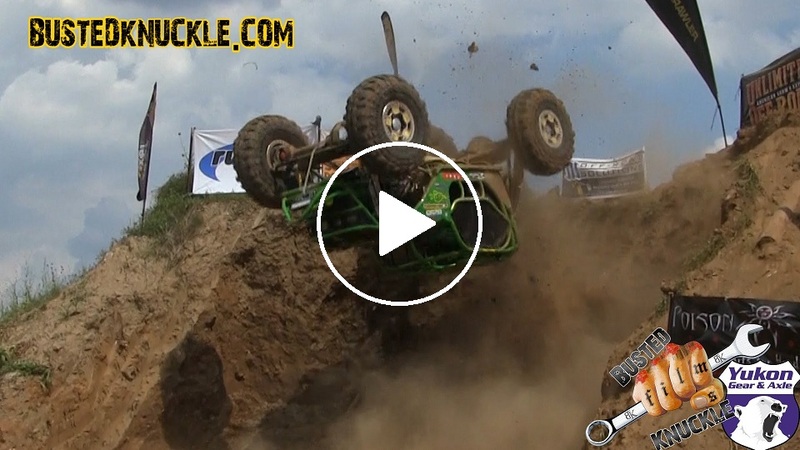 Dustin Ramacher is not the first Mega Mud Truck Driver to ever land a Mega Mud Truck Backflip and he won’t be the last. But he is the first to do a Corked Backflip or whatever you call this insane display of Insanity! The guys at West Georgia Mud Park built this special backflip ramp so the crazy Mega Truck pilots could get wild. Dustin didn’t event pull up on the ramp to feel it out. As soon as he hit the ramp his front driver side knuckle broke sending the tire and wheel flying off as the truck went over backwards. As it go completely upside down it rotated back to land on the 3 remaining tires. It was INSANE! The crowd went nuts, no one really knew what they had just witnessed. The harsh landing broke the rear driver shaft but other than that and the front spindle the truck was fully in tact. Check out the Video and let us know if you think it should count as a backflip. For more Backflip Videos check out the Busted Knuckle Video Youtube Channel. Check out the World’s First Rock Bouncer Backflip.